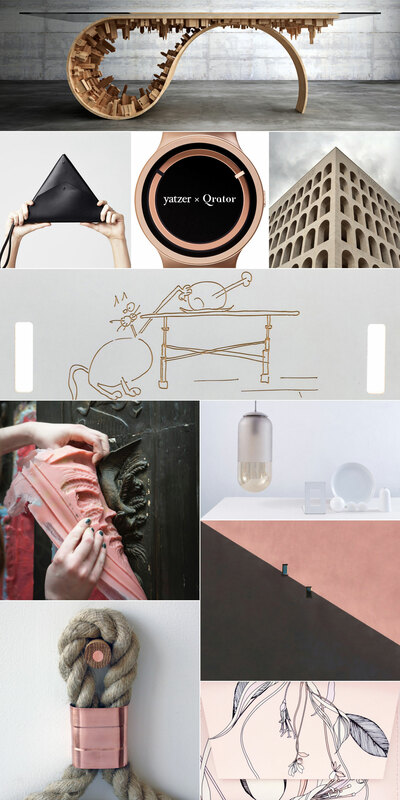 Yatzer x Qrator | Curated Collection of products from Qrator's designer collections. With our similar aesthetic sensibilities and passion for creativity, it was only a matter of time before Yatzer teamed up with Qrator, the London-based, curated online marketplace for art and design: Beginning in October through to December, Yatzer’s founder Costas Voyatzis will curate three beautiful collections of artworks and design objects, sourced straight from the pristine pages of Qrator and its talented members. Today we share the first of the three collections, which is infused with an unexpected mix of materials, riotous imagination and a healthy dose of pink. From fashion accessories to experimental rubber stools, there’s something for everyone in this handpicked selection of artefacts from all around the world! 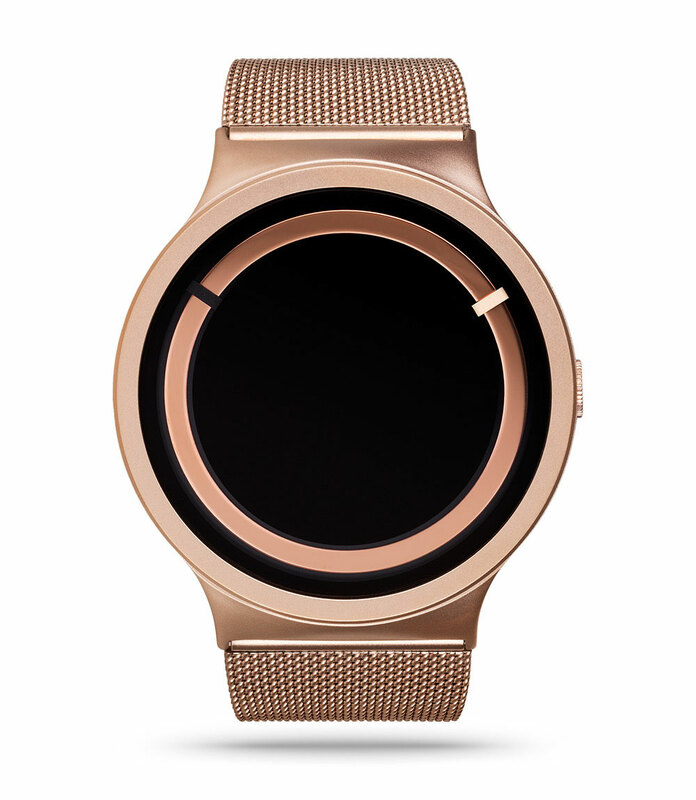 ECLIPSE Steel Rose Gold by ZIIIRO. To "zig while the world zags" is the message that the watchmakers of ZIIIRO would like their customers to embrace – and wearing their ECLIPSE Steel and Rose Gold Watch seems the best place to start! Inspired by the moon phenomenon, this 236 x 43 x 9.7 mm watch features what seems to be a blank, black face… until it reveals that the time-telling arms and dial have been minimally stripped down, appearing as simple, moveable bars around a rose gold ring. Weighing in at 0.09 kg, the watch is crafted from a 316L Stainless Steel Case with a PVD in matte, Rose Gold. All the time in the world will look different from now on! Twin View by Marcus Cederberg / 50x70cm / Printed on photo paper / Exclusive white wooden frame with wood from Sweden. 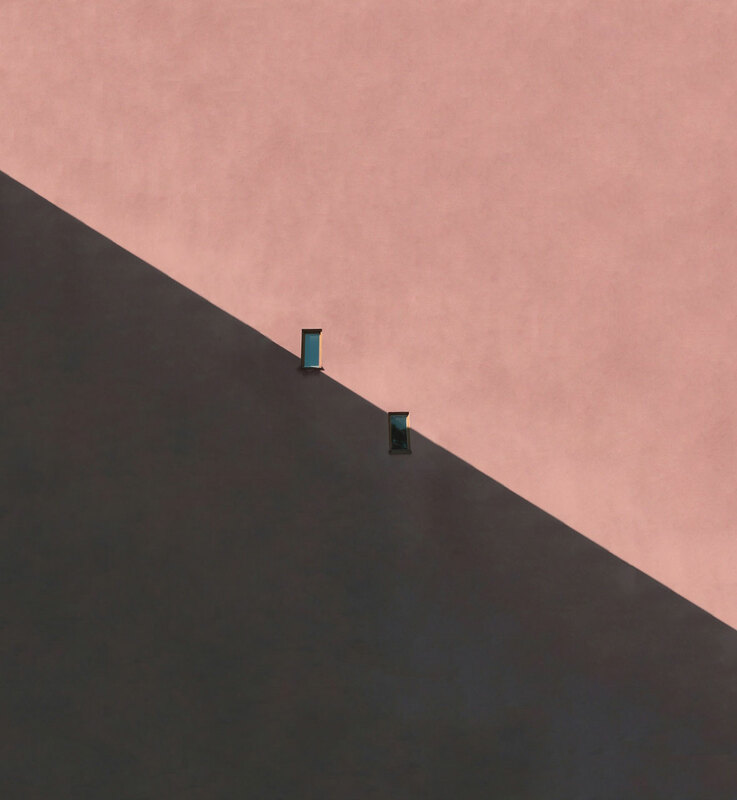 The bold, graphic pattern of Twin View, the 50 x 70 cm print by Swedish photographer, Marcus Cederberg, portrays a visual respite from the busyness of modern-day living. By focusing his lens on the diagonal colourblocking of the scene in front of him, the photographer provides viewers with a focus that aims to encourage "calm"… in a beautiful way. Printed on photo paper and offered in a white, Swedish wood frame, this eye-catching print seems just the thing to hang on the wall of the busiest room in one's house to encourage a different perspective. 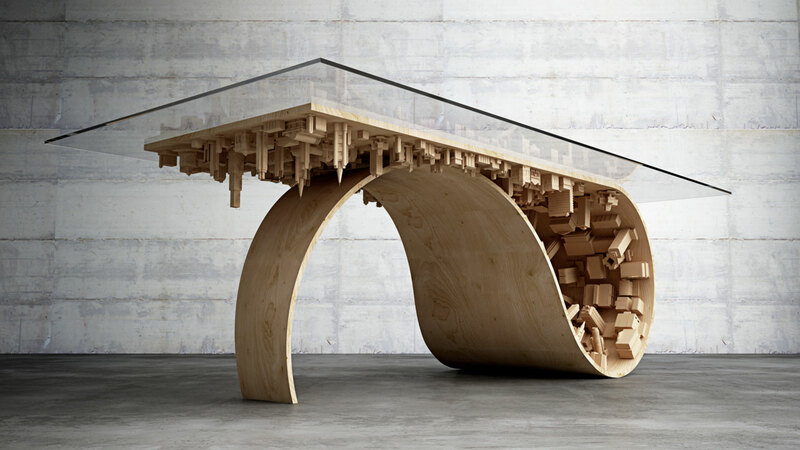 Wave City Dining Table by Stelios Mousarris. While some items are conversation pieces worth a mention or two at dinner parties, others have the ability to overtake the entire conversation, exactly the case with the Wave City Dining Table, which was conjured by Cyprus-based model maker and designer, Stelios Mousarris. 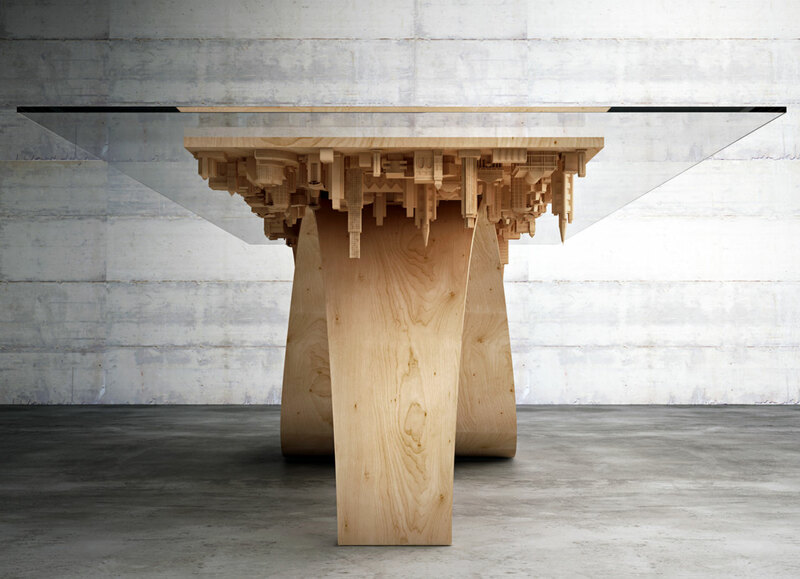 Credited as having been "inspired by a film," this impressive 250 x 120 x 76 cm wood and steel table seems intent on providing much inspiration itself - along with countless stares from one's dinner guests at the 3D printed city swirling around underneath the glass top of this limited edition piece. Don't be surprised if nobody realizes when the dinner's main course is served! Food Tray with Sketch by 157+173 Designers. Why not impart mealtimes, coffee breaks and everything in between with a bit of humour? This is exactly what the designers of 157+173, a product design and architecture studio based in Thessaloniki, Greece, must have been aiming for when they created this "sketchy" mdf tray. 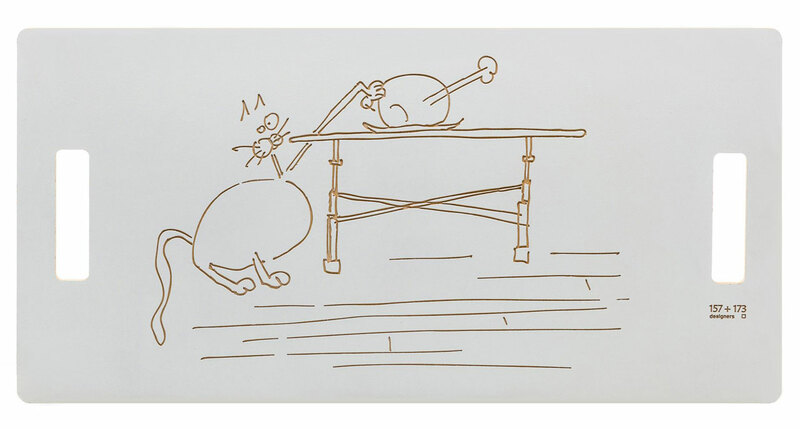 Featuring a humorous illustration of a cheeky, fat cat engraved on its surface - that's so cute it seems a shame to cover it up with plates and cutlery - this flat, 60 x 30 x 2 cm serving tray is hand finished with a waterproof varnish and ready to make itself useful! Papalina Suspension Light by Kanz Architetti. Thoroughly stripped of all unnecessary and inefficient forms of decoration, the Papalina Suspension Version Light created by Venice-based design duo, Mauro Cazzaro and Antonella Maione, of Kanz Architetti, proves that simple is where it's really at. 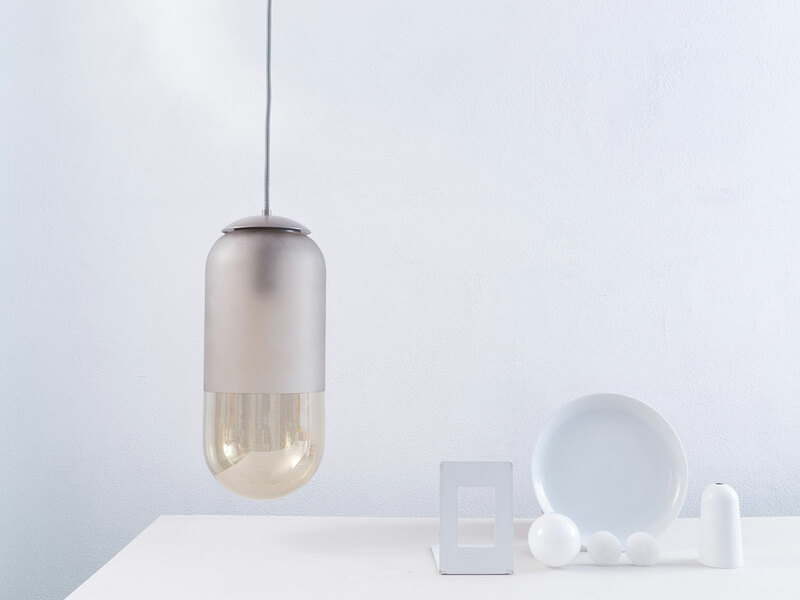 The light, which is available in blue, pink or bronze sandblasted and hand-coloured finishings, features a 15 x 33 cm handmade, blown glass diffuser and hangs from the ceiling from a 140 cm long cable, casting a warm - and minimally modern - glow wherever it is positioned to illuminate. "LEAVES AND FEATHERS" ipad Mini Sleeve by Melissa Crowley. High-tech meets artisanal in the "Leaves and Feathers" ipad Mini Sleeve, designed by Australia-born, San Francisco-based creative director and artist, Melissa Crowley. While the graceful pattern of the original, printed illustration might evoke thoughts of fairytales and whimsy, but the coated canvas, Eco-fi felt and minimal, nickel hardware of this 14.5 x 22 x 1.25 cm functional accessory mean business. Made to fit the ipad Mini like a glove (or perhaps we should say like a sleeve?) this isn't only a beautiful item but a thoughtful one as well, since Eco-fi felt is made from 100% post-consumer plastic bottles. CR Mirror Standard by M Dex Design. 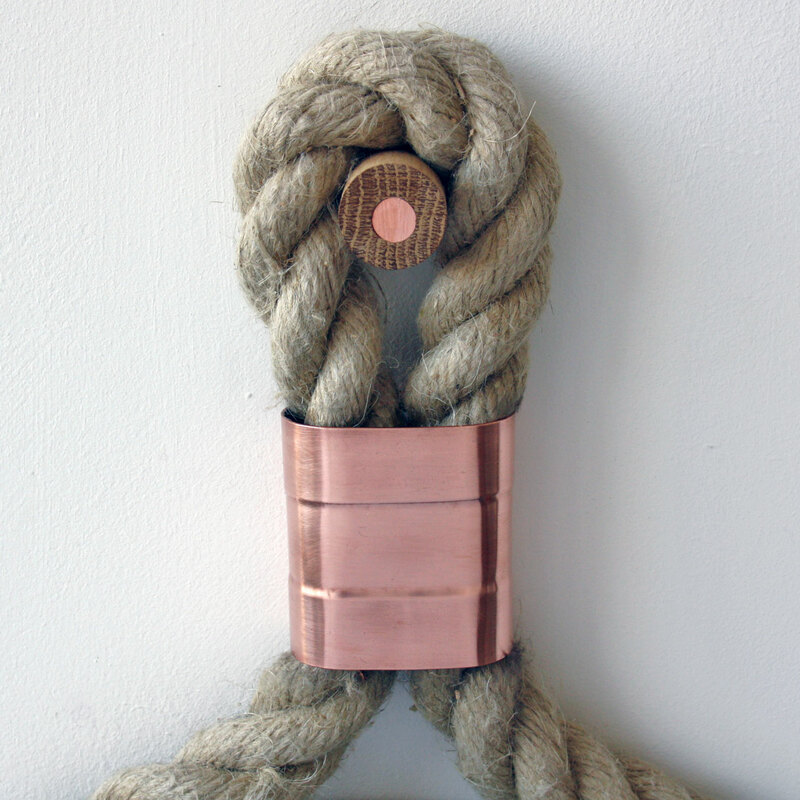 There is something super tactile about items made out of rope which intentionally, or unintentionally, always evoke thoughts of seafaring traditions. Such is the case with the inventive, hand-made CR Mirror Standard by U.K. based designer, Miles Dexter. 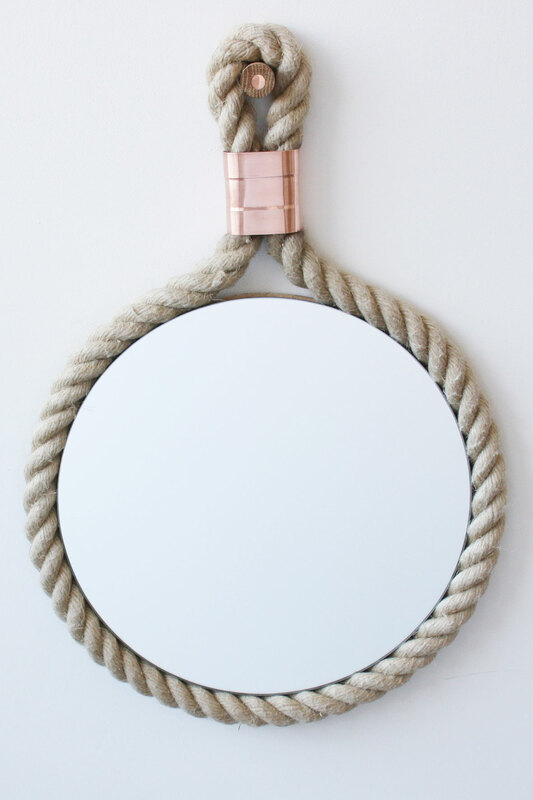 The hefty, 57 x 38 x 2.5 inch size of the flax rope framed mirror seems enticingly apt to portray the designer's wish to "create quality pieces that stand the test of time." Meanwhile, the hand-cut, folded and rolled copper clasps aid in the hardy, sustainable nature of this "urban yet organic" item that seems destined to become the quiet focus point of any room. (detail) CR Mirror Standard by M Dex Design. Squared Colosseum by Martina Bicceri. Mounted on Aluminum (5mm thick and display-ready with hanging hardware attached, print appears to be floating on the wall when hung). A grand monolith reaching towards the cloudy sky proves to be a surprisingly calming image - and the lens of increasingly celebrated Italian photographer, Martina Biccheri, captures exactly that feeling with Squared Colosseum. Featuring the imposing, Palazzo della Civiltà Italiana in Rome (which, in 2015 became the headquarters of Italian design giant, FENDI), the clean-cut frame and the multitude of curved archways filling this iconic example of Fascist architecture, juxtapose not only each other but also the free-flowing swirl of the clouds in the background. Meanwhile, the 50 x 75 cm print on photo paper is mounted on a 5 mm thick aluminum base, which creates the impression that the image is actually "floating" on the wall it is hung on. A conversation piece or a calming influence… the viewer decides. 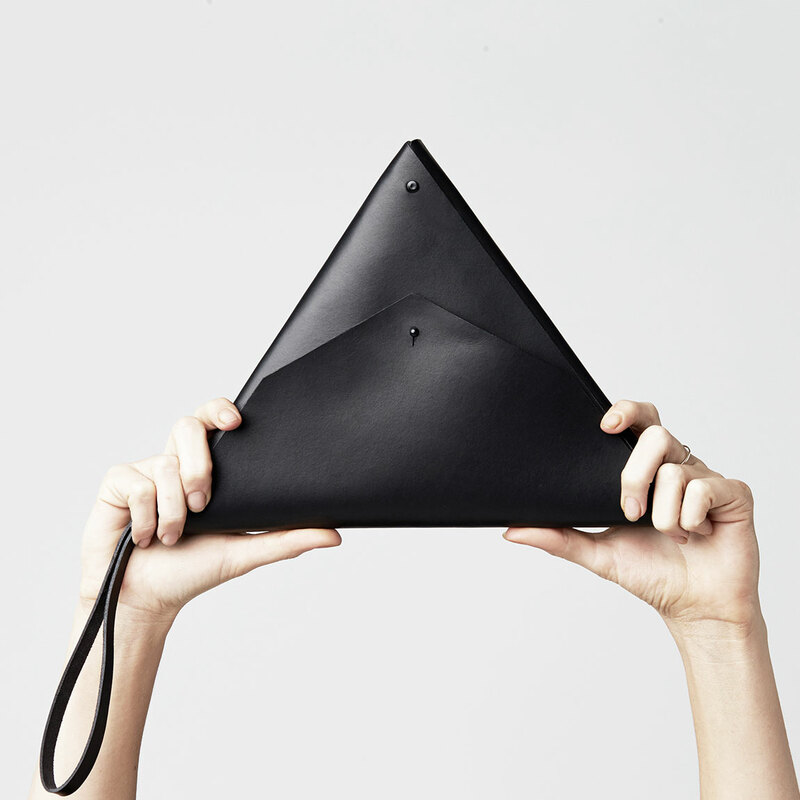 Triangle Clutch Nero by Minima. Encouraging a fresh perspective on a timeless design seems to be the catalyst of the Triangle Clutch Nero, designed by Minima, the label of Perth-based accessories designer, Amanda Kaye. Entirely handcrafted out of the finest, vegetable tanned, Italian leather through the use of traditional construction techniques from around the world, this 30 x 25 x 25 clutch features a handy, detachable wrist band, a matt, black stud closure and waxed thread detailing. Not only is it the perfect size to hold all of one's evening essentials, this little clutch also seems to be the perfect little essential in itself. 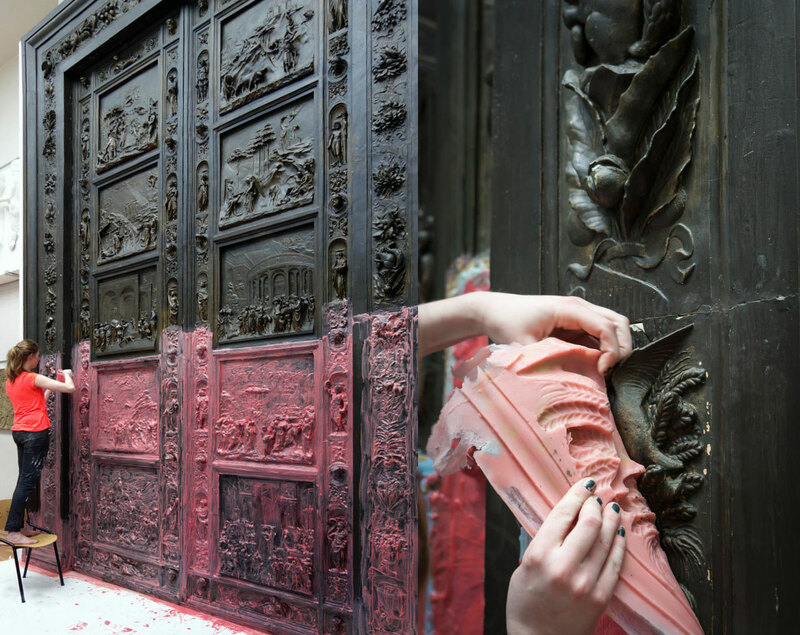 The making of "Elements of Time" series of furniture by Nynke Koster. Have you ever wanted to sit on a Baroque ceiling? Although it seems a strangely wondrous question, the oddly enticing opportunity to do so has now materialised through the unique, Art Nouveau Rubber Seating created by artist, Nynke Koster, for her Elements of Time series of furniture. 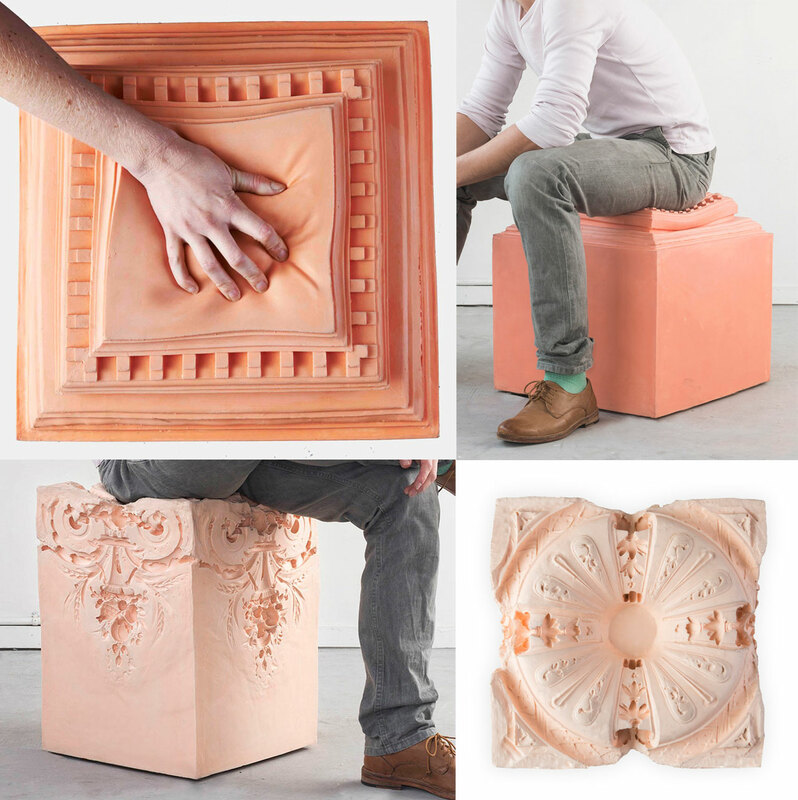 The series was inspired by beautiful architectural features - such as the art nouveau butterflies discovered by the artist in a beautiful building in Amsterdam, which are depicted on the rubber seating - and inventively translated into the 49 x 45 x 45 cm functional art object which was entirely hand-made from rubber foam on a wood frame. "Elements of Time" series of furniture by Nynke Koster. H 50 x W 39 x D 39 cm / Foam with rubber, Frame of wood.